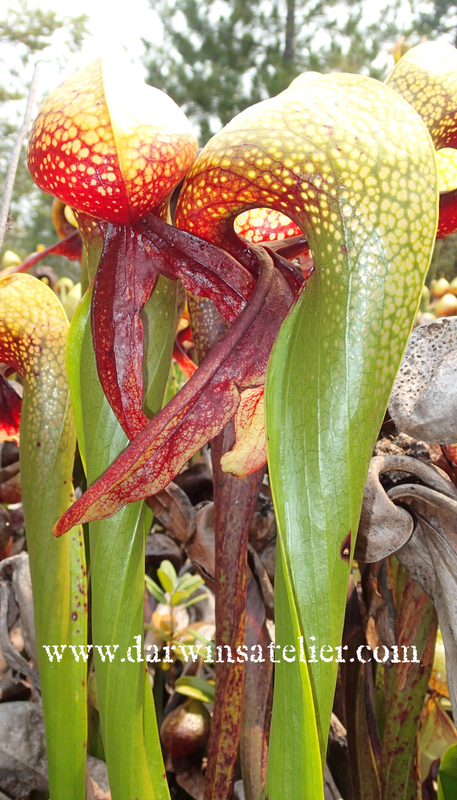 Darwin’s Atelier participated in the International Carnivorous Plant Society meeting took place in Santa Rosa, CA in Aug. 2018. 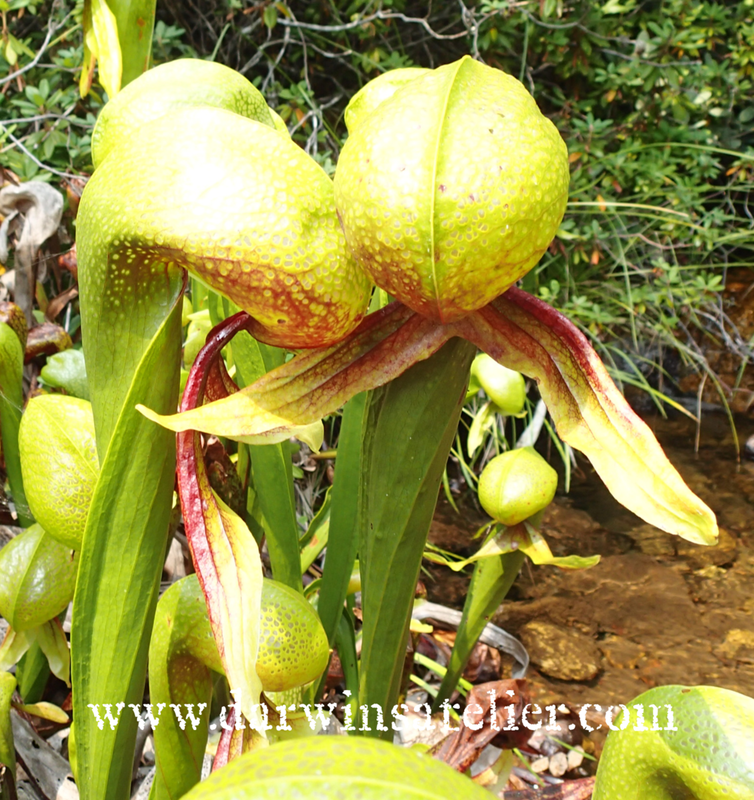 After the conference, some of us joined the field trip to see Darlingtonia californica, aka Cobra Lily. D. californica is a carnivorous plant that is super endemic (grows only in specific places in the world) to the border between northern California and southern Oregon. As the name suggests, the trap of D. californica has a bulbous head with a tongue sticking out as if a cobra is ready to strike! We visited 12 different sites spanning between CA and OR. Although D. californica won’t grow everywhere, but when they find the right conditions, they appear to thrive. In all sites we visited, we found clumps of gorgeous healthy adult plants with seed pods. Unfortunately, the blooming season was over, but all flowers seemed to have set seeds, and numerous seedlings were coming out, which is a good sign of continuous growth into the future. This was a beautiful site in CA. Darlingtonia were everywhere all around the perimeter of this small pond. It was very magical, like a fairy land of the Cobra Lily, except that all the fairies would be glowing trapped inside the plants!? This was a protected bog full of Darlingtonia in CA. There was a boardwalk to guide you through this site. It was small, but the place was packed with these handsome Cobras! This short stretch of wall was actually covered with D. californica and Pinguicula macroceras. It was absolutely spectacular to see both species growing over from top to bottom of this cliff. 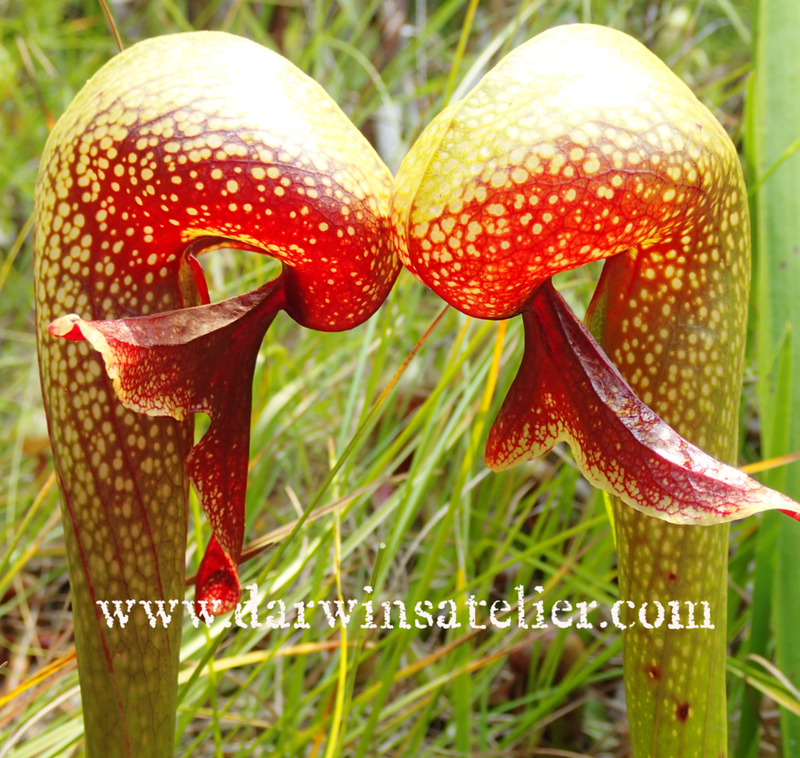 Here are some of the cute little Darlingtonia conversations we witnessed during the trip. Lo and behold! 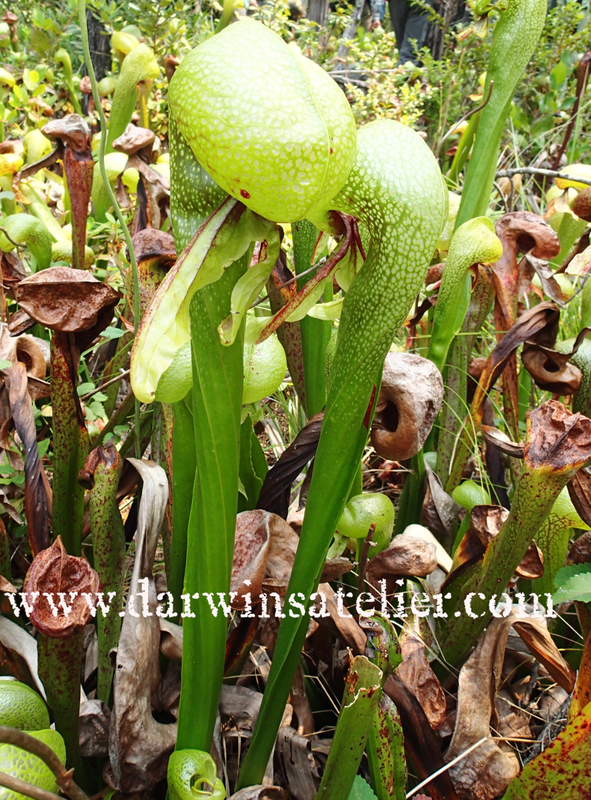 This was the great hill of a carpet of Darlingtonia! On the other side of this hill, a big natural fire was burning. In fact, we did not even know if we were allowed to visit until we got there, as the national guard were restricting the traffic. Thanks to our capable guides Gina and Arthur who negotiated with the guards, we were able to get in! However, we were reminded constantly that we needed to be ready to get out of there at a moment’s notice in case the fire got too close. By the way, we were told later that this site survived the fire. Hurray! Hot, muddy and sweaty? Why not jump into the river! What made this trip so memorable was not only the plants, but also the people. We were all nice and fun loving bunch. After being covered with muck and sweat, taking pictures of the same plant over and over again all day under the blazing sun for 5 days, we certainly became like a little family (of plant nerds?). 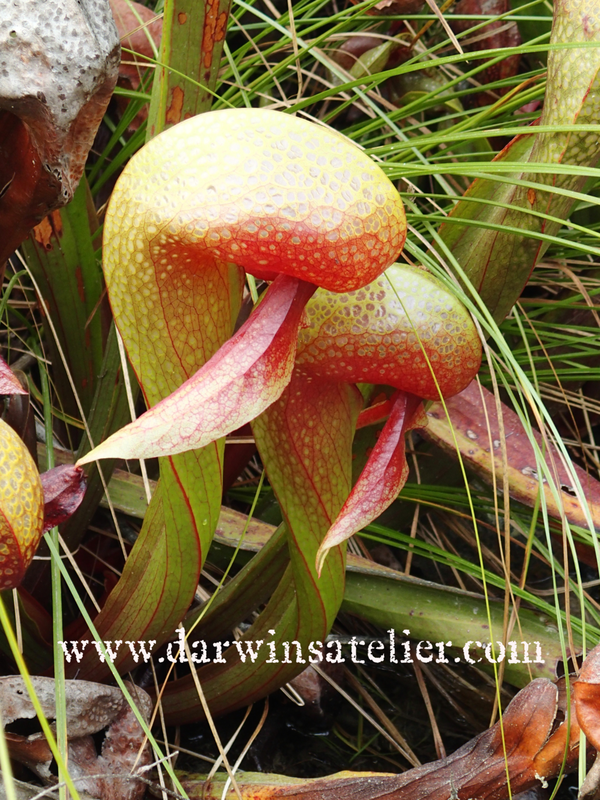 Darwin’s Atelier would like to thank especially Damon Collingsworth (California Carnivore), Arthur and Gina Morimoto (Bay Area Carnivorous Plant Society) for organizing such a wonderful trip! Also Barry Rice and his wife Beth, who guided and taught us unique biological aspects of all the different sites. We would also like to thank Luke Basulto, who was the designated driver of our 12 passenger van, and took us everywhere safe and comfortable! Last but not least, all the CP lovers who joined the fun. Thank you all. We miss you!